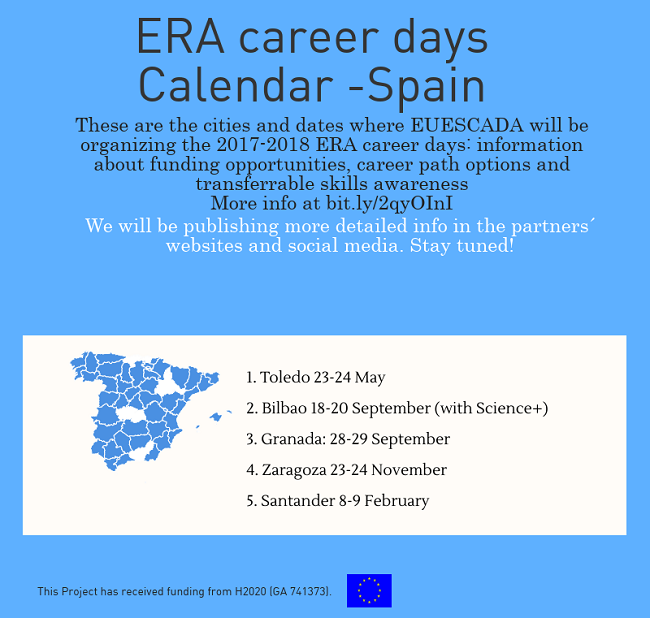 Home › Spain Network › EUESCADA "EURAXESS España Career Day"
EUESCADA "EURAXESS España Career Day"
During the next twelve months, FECYT will coordinate the European project “EUESCADA” in which 6 more partners participate: the Universidad de Cantabria, the Universidad de Zaragoza, the Universidad de Granada, the Universidad de Castilla La Mancha , the Agencia Andaluza del Conocimiento , and Bizkaia:Talent. EUESCADA aims at offering as much information as possible to last-year university students and researchers in Spain currently facing career decisions. Information about European and national funding opportunities, professional alternatives to academia, geographical mobility options, skills and competencies of researchers and how to improve them will be offered. In a word: the objective is that researchers are better prepared when making their career choices. EUESCADA will organize five different career days in five different cities (Santander, Zaragoza, Granada, Toledo y Bilbao) and each host institution will work in a programme that will acknowledge the region´s needs and will also coordinate the participation of different agents. Also, FECYT will invite participants to fill a career tracking survey that aims at having a first view of professional situation and expectations of young researchers in Spain. What is the role of FECYT? FECYT is the coordinator of the project. I am a member of EURAXESS Spain. How can I get the most out of EUESCADA? All the members of EUESCADA are EURAXESS Spain members. If you are a member of the network and want to take this opportunity to organize a career day about professional opportunities for researchers in your institution (a so-called “ERA Career day”), in EUESCADA we can help you about what issues you could cover, the success indicators we will be using, etc. Just contact us at euraxess-spain@fecyt.es . During 2017, FECYT and the rest of the partners will publish the date and agendas of the ERA Career days so that participants can join. Also, some of the ERA Career days will be streamed. All registered attendants to the ERA career days were invited to participate in a survey about their level of satisfaction after the event and about their careers and professional perspectives. Download the report on EUESCADA survey's results (884.58 KB) here!